1. Adjust oven rack to middle position and preheat oven to 375°F. Place prosciutto on a parchment paper-lined baking sheet and bake until prosciutto becomes very crispy, about 8 minutes. Drain on paper towels and let cool completely. Crumble prosciutto into shards. Set aside. 2. In a blender, combine cantaloupe, cucumber, onion, ice water, and vinegar and blend at high speed until smooth. With blender running, slowly drizzle in olive oil. Blend until smooth and frothy, about 1 minute longer. Season with salt. Transfer gazpacho to airtight container and refrigerate until chilled, about 1 hour. 3. Brown your sage by sauteing in butter, low heat, for 1-2 minutes or until butter turns brown and gives off a sweet sage smell. 4. 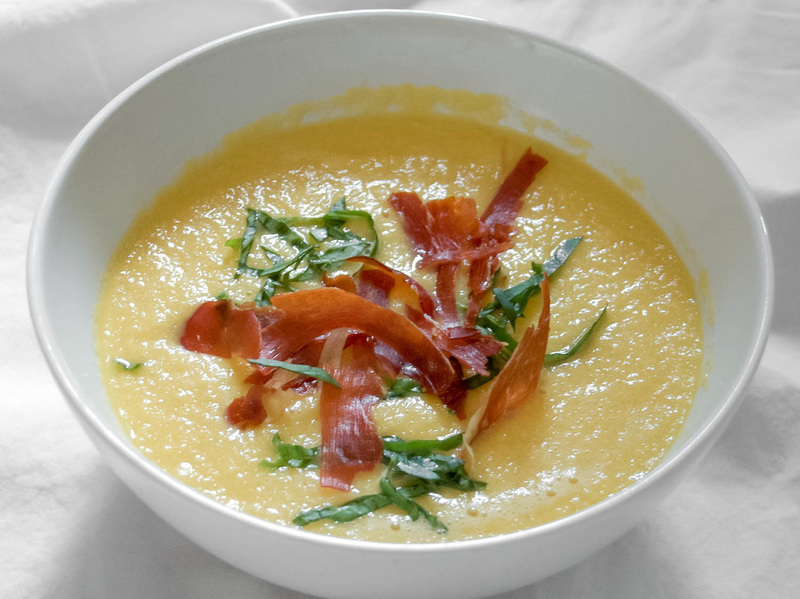 Divide gazpacho between serving bowls and top with crispy prosciutto and browned sage.